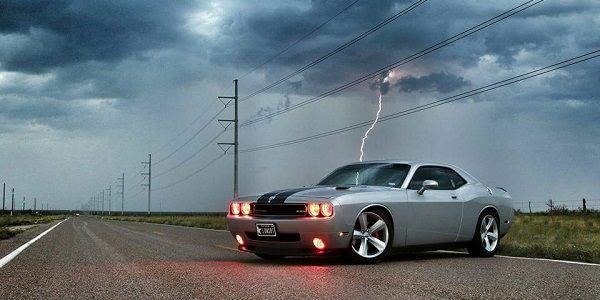 Today I was surfing at Mopar Photoautographs group on Facebook and saw this totally awesome shot of the Dodge Challenger SRT8 under lightning in Texas. I asked the owner Ezra Arenivas how he did it and if the car was damaged at all. Here is what Ezra wrote to TorqueNews for our readers. So I pulled over on Yukon Road way out west of town where I would always capture pictures with a beautiful sky to compliment my car. I had my little brother with me that day who was also a photographer and taught me what I know today. He had me park my car in the middle of the road and we started to take some really great shots when all of a sudden it started to sprinkle on us pretty hard but didn't stop us from what we loved to do. A few shots into the storm we captured one of the greatest pictures of a Dodge Challenger ever. We caught a beautiful lightning strike just at the right time. It was so perfect it almost looks fake but that's the beauty of mother nature. West Texas is one of the most beautiful places to capture mother nature in its finest moments.